Background E-cigarettes or electronic nicotine delivery systems (ENDS) are designed to deliver nicotine-containing aerosol via inhalation. Little is known about the health effects of flavoured ENDS aerosol when inhaled. Methods Aerosol from ENDS was generated using a smoking machine. Various types of ENDS devices or a tank system prefilled with liquids of different flavours, nicotine carrier, variable nicotine concentrations and with modified battery output voltage were tested. A convenience sample of commercial fluids with flavour names of tobacco, piña colada, menthol, coffee and strawberry were used. Flavouring chemicals were identified using gas chromatography/mass spectrometry. H292 human bronchial epithelial cells were directly exposed to 55 puffs of freshly generated ENDS aerosol, tobacco smoke or air (controls) using an air–liquid interface system and the Health Canada intense smoking protocol. The following in vitro toxicological effects were assessed: (1) cell viability, (2) metabolic activity and (3) release of inflammatory mediators (cytokines). Results Exposure to ENDS aerosol resulted in decreased metabolic activity and cell viability and increased release of interleukin (IL)-1β, IL-6, IL-10, CXCL1, CXCL2 and CXCL10 compared to air controls. Cell viability and metabolic activity were more adversely affected by conventional cigarettes than most tested ENDS products. Product type, battery output voltage and flavours significantly affected toxicity of ENDS aerosol, with a strawberry-flavoured product being the most cytotoxic. Conclusions Our data suggest that characteristics of ENDS products, including flavours, may induce inhalation toxicity. Therefore, ENDS users should use the products with caution until more comprehensive studies are performed. A recent report by Barrington-Trimis et al12 outlined the need for research on flavour additives used in ENDS, noting the lack of safety data on long-term health effects from inhaling flavouring chemicals. There is a need to develop toxicological test models, which characterise the toxic response and cellular interaction between constituents of inhaled ENDS aerosol, including flavours, and the respiratory system. The extent to which variable product features, including flavourings, impact cellular responses is currently not well defined. Inhalation of complex mixtures such as flavoured ENDS aerosols can cause a wide range of adverse health effects, ranging from simple irritation to systemic diseases.21 Traditionally, inhalation toxicity has been performed on test animals to identify various end points, including the lethal concentration of airborne materials or maximum tolerable concentration.22 In vitro studies in which a solution of the aerosol ingredients is applied in the medium overlay do not model an inhalation exposure. They also may not be suitable for studying, for example, the effects of some poorly soluble flavouring compounds, such as limonene. More recently, novel in vitro methods have been developed that allow the direct exposure of airborne material to cultured human target cells on permeable porous membranes at the air–liquid interface (ALI). In ALI exposure systems, the cells are provided with nutrients from the basal side of the membrane while the apical side, with the cultivated cells, is in direct contact with the test aerosol. The effects of ENDS aerosols on respiratory cells cultured at the ALI can be used to study cell injury or activation and the release of bioactive mediators including cytokines. Therefore, in vitro studies using an ALI model open up new ways to test ENDS toxicity.23 We are aware of only one study published to date that used the ALI method to study ENDS toxicity.13 However, that study focused on proinflammatory effects of two ENDS, as measured by secretion of two inflammatory cytokines (interleukin (IL)-6 and IL-8), rather than cytotoxicity or metabolic activity. In our study, the physiologically relevant ALI system was used to individually and systematically evaluate in vitro effects of many of the variables related to ENDS products, including several of the most popular flavours. By testing different types and brands of ENDS products, along with product features on cell viability, cell metabolic activity and inflammatory cytokine production in an ALI system, this study hopes to establish the impact of various product characteristics on potential inhalation toxicity of ENDS products. ENDS devices and refill solutions were selected for study from a vast and rapidly changing array of products. Six types of ENDS were purchased from gas stations, convenience stores, online retailers and local ‘vape’ shops in Buffalo, New York, USA; Daly City, California, USA and online (table 1). Refill solutions for tank systems in five flavours tobacco, piña colada, menthol, coffee, and strawberry were also purchased from a local ‘vape’ shop in Buffalo, New York, USA (table 1). Tobacco reference cigarettes 3R4F were obtained from the University of Kentucky. In a pilot experiment, cells were exposed to six different ENDS products including a disposable e-cigarette, rechargeable e-cigarette, tank-type eGO device, a personal vaporiser, an ePipe and an eCigar (table 1). In all subsequent experiments, we used one type of ENDS device, specifically an eGo tank system (Vision Spinner), with battery output voltage fixed at 3.3 V. However, we systematically and individually modified product features by refilling the device with various carriers, with solutions of variable nicotine concentration or solutions with different flavours. To compare the cellular toxicity of carriers, e-liquids containing 24 mg/mL of nicotine and without flavour were prepared in a laboratory using USP-grade ingredients (US Pharmacopeia) in propylene glycol (PG)-only, vegetable glycerin (VG)-only or a 50/50 mixture of PG/VG, along with 5% distilled water. To study the effects of nicotine concentration on bronchial epithelial cells, an eGo tank system was set to 3.3 V and prefilled with PG-only unflavoured solution that contained 0, 6, 12, 18 or 24 mg/mL of nicotine. Nicotine concentrations in all tested products were determined using gas chromatography with a nitrogen-phosphorous detector (GC-NPD), as described previously.24 ,25 To measure the effects of ENDS voltage on cellular toxicity, aerosols were generated from an eGo tank system filled with PG-only solution containing tobacco flavour and 24 mg/mL of nicotine that was set to 3.3, 4.0 or 4.8 V.
To study the effects of flavours, an eGo tank system set to 3.3 V was prefilled with PG-only liquid containing the same nicotine concentration (24 mg/mL; labelled) but with various flavours (table 2). Flavouring chemicals were identified in each liquid using a GC/MS method, as described in online supplementary materials. An untargeted analyte list was generated and included the 11 compounds listed in table 2. Tobacco, piña colada, menthol, coffee and strawberry had the following GC-NPD determined nicotine concentrations: 23.0, 22.5, 22.0, 21.8 and 22.5 mg/mL, respectively (table 2). No GC-NPD analysis was performed on aerosols generated from the fluids. Aerosol from ENDS products, as well as tobacco smoke, was generated using a Borgwaldt LX-1 (Richmond, Virginia, USA) single-port piston-operated smoking machine. The puffing protocol was based on the Health Canada Intense method,26 using the following conditions: 3 s puff duration, every 30 s, with a 55 mL puff volume. The puffing protocol was implemented continuously for 30 min, resulting in a total of 55 puffs. A period of 30 min was used as this was the minimum exposure time examined in which we saw significant differences between ENDS aerosol and the air control (data not shown). Air exposures (control) were run during each experiment, and five 3R4F reference tobacco cigarettes were smoked for comparison using the same method as for the ENDS products. In pilot studies, cells were exposed to air by two different methods: either we used a 12 psi constant supply of air for 30 min or we drew air over the cells for 55 puffs (for a total of 30 min) using the smoking machine. No significant differences were found between methodologies. Therefore, we employed the smoking machine method to generate air controls for each experiment. The NCI-H292 cell line (American Type Culture Collection) was used for all experiments. A detailed description of the maintenance and propagation of H292 cells is provided in online supplementary materials. This study used an ALI system that enables direct exposure of cells to ENDS aerosol (see online supplementary figure S1). Cells were grown on the apical side of 0.4 µm permeable supports (PS) under standard conditions for cell maintenance (described in online supplementary materials). Immediately prior to exposure, the media were aspirated from the apical side of the PS, and cell-containing inserts (n=3) were placed in the ALI chamber. While the cells were directly exposed to ENDS aerosol, fresh media were cycled over the basal side of the PS at a flow rate of 25 mL/min. The ALI chamber was cleaned with methanol and distilled water between exposures. Metabolic activity of exposed cells was measured by neutral red uptake assay. Cell viability was measured by trypan blue assay. Cytokine release was measured as an indicator of cell inflammatory response. 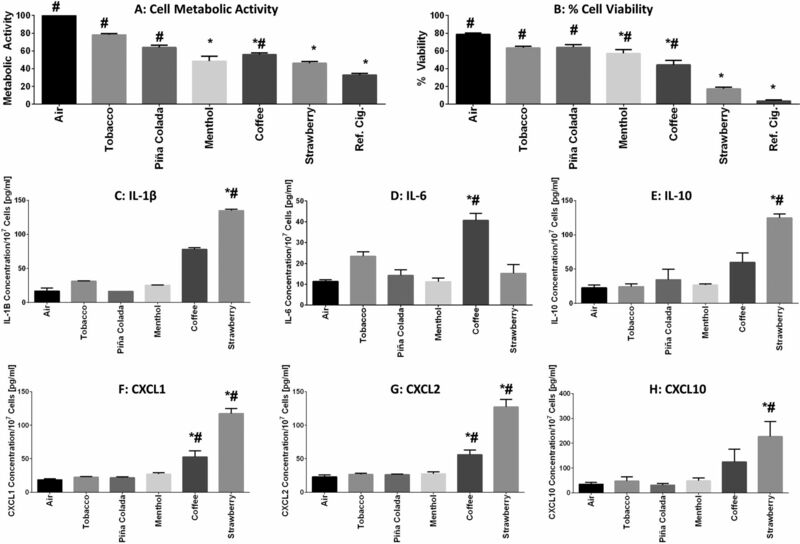 Seven cytokines (IL-1β, IL-6, IL-10, CXCL1, CXCL2, CXCL5 and CXCL10) were measured using commercially available enzyme-linked immunosorbent assay kits. For all assays, we followed protocols provided by the manufacturer. Detailed descriptions of each assay are provided in online supplementary materials. Note that CXCL5 levels measured were below the limit of quantitation for each tested condition. Thus, CXCL5 results are not presented. Statistical analysis was performed using Prism V.6.07 (GraphPad). Kruskal-Wallis non-parametric tests were performed for each study outcome to compare (1) the mean rank of ENDS products versus air controls, (2) the mean rank of ENDS products versus reference cigarettes and (3) the mean rank of every ENDS product to other ENDS products excluding the air and reference cigarette controls. All experiments were performed at least in duplicate, with each outcome measured three times per experiment. Aerosol generated from various types of ENDS products (disposable e-cigarette, rechargeable e-cigarette, eGo tank system, personal vaporiser, ePipe and eCigar) differed significantly in their toxicity to bronchial epithelial cells (table 3A,B and online supplementary table S1). Metabolic activity and viability of H292 cells significantly decreased (p<0.05) after exposure to aerosols from the eGo tank system, personal vaporiser and ePipe as compared to air control (table 3A, B). A significant decrease in metabolic activity, but not cell viability, was observed between the air control and the blu rechargeable e-cigarette. Notably, some ENDS products tested in the study including the eGo tank system, personal vaporiser and ePipe did not differ significantly from tobacco cigarettes in their effect on metabolic activity or cell viability. However, the disposable e-cigarette, rechargeable e-cigarette and eCigar products were significantly less toxic than tobacco cigarettes (table 3A, B). When examining cytokine release on exposure of H292 cells to ENDS aerosol, we found a significant increase in IL-1β, IL-6 and CXCL1 for the rechargeable e-cigarette, as compared either to the air control or to the reference tobacco cigarette. IL-6, IL10, CXCL1 and CXCL2 release were significantly different between the personal vaporiser and ePipe compared to air, as well as between the ePipe and the reference cigarette (table 3A, B). Not all ENDS products were equivalent with regard to cytokine release. For example, the eGo product did not mediate a change in any of the tested cytokines (table 3A, B and online supplementary table S1). The above-described pilot experiments confirmed our hypothesis that various ENDS products differ with regard to their cellular toxicity and cause different inflammatory reactions in cells directly exposed to aerosols. However, owing to diversity of the products, we could not attribute toxic effects to a specific feature of each product. We therefore undertook a systematic study to determine how individual product features including flavours, nicotine carrier, nicotine concentration and battery output voltage contribute to cellular toxicity and inflammatory responses in H292 cells. By exposing H292 cells to aerosols generated from the same device (eGo tank system with battery voltage set to 3.3 V and filled with PG-only based liquids containing similar nicotine concentrations (labelled and verified with a chromatography method)) but containing one of five different flavours, tobacco, piña colada, menthol, coffee or strawberry, we found that flavours have a significant and differential effect on in vitro toxicity. Most notably, menthol, coffee and strawberry-flavoured aerosols significantly reduced cell viability and metabolic activity compared to air controls (p<0.05, figure 1 and table 3A, F). Interestingly, the effects of a strawberry-flavoured aerosol on metabolic activity and cell viability were not significantly different from those obtained with tobacco cigarettes. Piña colada-flavoured aerosol had an intermediate effect: it decreased metabolic activity as compared to air controls but had no significant effect on cell viability. In contrast to other flavours, aerosol generated from tobacco-flavoured liquid did not alter either viability or metabolic activity compared to air controls and was significantly less toxic than tobacco smoke (p>0.05). When examining cytokine release, aerosols generated from coffee-flavoured and strawberry-flavoured liquids significantly increased cytokine levels compared to air controls (figure 1 and table 3A, F) or reference cigarettes (table 3A, F). Release of all tested cytokines except for IL-6 was induced by the strawberry-flavoured aerosol. Coffee-flavoured aerosol increased cytokine levels of IL-6, CXCL1 and CXCL2 compared to air controls. As the only difference among the products tested in this experiment was the flavour in liquids, we conclude that (1) flavours affect the in vitro toxicity profile of the product and (2) among all tested flavours, the product labelled strawberry was most toxic. Five nicotine concentrations were examined: 0, 6, 12, 18 and 24 mg/mL. No significant differences (p<0.05) were observed between the various nicotine concentrations and the air control for metabolic activity and viability. Significant differences (p<0.05) were found among 0, 6, 12, 18 and 24 mg/mL concentrations and tobacco cigarette smoke for metabolic activity and/or viability. When compared against each other, we did not observe significant differences among the variable nicotine concentrations in either metabolic activity or viability (see online supplementary table S1). When examining the effect of nicotine concentration on cytokine release, we found significant decreases in IL-1β, CXCL1 and CXCL2 in response to exposure to 18 mg/mL of aerosol versus air controls (table 3A, D). IL-6 was significantly increased in response to 24 mg/mL of aerosol versus air control. IL-1β and CXCL2 levels were significantly decreased between 18 mg/mL of aerosol and the reference cigarette. Significant differences were observed among aerosols with variable nicotine concentrations for IL-1β, IL-6, CXCL1 and CXCL2 (see online supplementary table S1). To study carrier effects, H292 cells were exposed at the ALI to aerosols generated from the same ENDS device (eGO tanks system set to 3.3 V) filled with unflavoured liquids containing the same nicotine concentration of 24 mg/mL in (1) PG-only; (2) VG-only or (3) a 50/50 mixture of PG/VG (table 3A, C). Compared to air controls, exposure of H292 cells to aerosols containing each of the tested carriers resulted in a significant decrease in cell viability (p<0.05). However, all tested carriers were significantly less toxic to H292 cells than smoke from tobacco cigarettes (table 3A, C). We found significant differences among the carriers themselves in their effects on cell metabolic activity (see online supplementary table S1), as the metabolic activity was significantly decreased in cells exposed to PG:VG and VG-only aerosols but not to PG-only as compared to air controls. When examining carrier effects on cytokine release, we identified a significant increase in all tested cytokines except CXCL1 and CXCL10 in cells exposed to PG-only as compared to air controls (table 3A, C). Three battery output voltage settings were tested: 3.3, 4.0 and 4.8 V. Metabolic activity and cell viability were significantly decreased (p<0.05) by the 4.0 and 4.8 V devices versus the air control (table 3A, E). Aerosol generated with the device set to lower voltage (3.3 V) was not different than air and significantly less toxic than tobacco smoke (p<0.05; for metabolic activity and cell viability, table 3A, E). We found significant differences among voltage settings in their effects on metabolic activity and cell viability (see online supplementary table S1). When examining the effect of battery output voltage on cytokine production, we found a significant increase in all tested cytokines as a result of the 4.8 V setting when compared to air controls. This study used the physiologically relevant ALI system to systematically examine the cytotoxic and inflammatory effects of several ENDS variables including product type, nicotine concentration, carrier, product voltage and ENDS liquid flavour. Our results demonstrate that ENDS products significantly differ in their cellular toxicity to bronchial epithelial cells. This is an important finding to further understand the complexity of ENDS products. By systematically evaluating various product features, we were able to identify device power and flavouring additives as key components that significantly affect the potential toxicity of ENDS. This finding has important regulatory implications because both features of the ENDS products can be regulated and standardised. Our data indicate that ENDS users may reduce the potential harm from inhaling flavoured products by selecting flavours of lower toxicity profile and operating their device in lower power settings. A novel finding of our study is that flavours used in ENDS liquids can have an acute cytotoxic effect on respiratory cells. We discovered that menthol, coffee and strawberry flavours had a significant impact on overall cytotoxicity of ENDS products. However, an important limitation of our study is that we did not look which of the flavouring compounds (as listed in table 2) caused this cytotoxicity and release of inflammatory mediators. Additionally, only one ENDS liquid product was tested for each flavour name (eg, strawberry). It remains to be determined whether other ENDS liquid products with the same flavour name that may contain an alternate flavour chemical composition yield a similar result. Further studies are needed to investigate the cytotoxic effect of single flavouring chemicals in ENDS liquids, combinations of these ingredients and the effects of alternate ENDS liquid products with the same flavour name. Our study indicates that testing toxicity of ENDS products should not be limited to individual flavouring chemicals since the ENDS liquids are complex mixtures, and other product features (eg, voltage) contribute to overall toxicity of ENDS aerosol. Finally, although we used the physiologically relevant ALI system, our study did not aim to estimate any harmful effects in ENDS users. Future in vivo studies are needed to confirm the applicability of our findings to human behaviours since exposure to flavoured ENDS aerosol among most vapers would be different than puffing protocol employed in our study. Only a few studies have looked at the flavouring chemicals used in ENDS liquids. In GC/MS screening tests, we were able to tentatively identify several flavouring chemicals present in different products. When compared to the most comprehensive flavouring chemical scans to date,9 ,10 we found five flavouring chemicals (3-methylcyclopentane-1,2-dione, menthol, limonene, benzyl alcohol and γ-decalactone) that were the same and six that were distinct from those previously reported. Screening the cytotoxicity of each flavouring chemical can be a very labour and time-consuming task, especially when one considers the number of possible interactions between different combinations of flavours with device power and carriers. There is an urgent need for time-effective and cost-effective methods to test flavoured ENDS products for their potential health effects. In summary, our data indicate that combinations of product, voltages and flavourings exist that are cytotoxic to airway epithelial cells. ENDS users should use the products with caution until more comprehensive studies are performed. Since our study focused on the acute effects of flavoured ENDS products, our observations require verification in chronic exposure models, more relevant to regular use of ENDS products. The extent to which various product features and ingredients, including flavourings, impact electronic nicotine delivery systems (ENDS) safety and potential toxicity is currently not well defined. We tested different types and brands of flavoured ENDS on cell viability, cell metabolic activity and release of inflammatory cytokines in bronchial epithelial cells exposed in vitro directly to freshly generated ENDS aerosol. We found that various ENDS products differ with regard to their cellular toxicity and can cause different inflammatory reactions in cells directly exposed to aerosols. This study revealed that flavours significantly affect the in vitro toxicity profile of the ENDS products, and among all tested flavours, a commercially available fluid labelled strawberry was the most toxic. The authors thank Tatiana Shaurova, Erin McConnaghy and Kristina Powers for their assistance in running air–liquid interface experiments. The authors also thank Chelsea Koch for her assistance in running ELISA assays.
. Research on e-cigarettes examining health effects: regulations due. Nations Health 2013;43:1–10. CDC. Notes from the field: Electronic Cigarette Use Among Middle and High School Students—United States, 2011–2012. 2013. http://www.cdc.gov/mmwr/preview/mmwrhtml/mm6235a6.htm (accessed 26 May 2016).
. Electronic cigarettes modulate platelet inflammatory, adhesion, activation and aggregation responses. FASEB J 2016;30(Suppl 1):722.5.
. Electronic cigarette inhalation promotes inflammatory cytokines within the airways and systemic inflammation in mice. Am J Respir Crit Care Med 2016;193:A4844.
. Inhalation toxicology. In: Luch A, ed. Molecular, clinical and environmental toxicology. Basel, Switzerland: Birkhäuser, 2010: 461–88. Health Canada. Official Method T-115, Determination of “tar”, nicotine and carbon monoxide in mainstream tobacco smoke, prepared by the Department of Health, 1-7, dated 31 December 1999. http://www.hc-sc.gc.ca/hl-vs/alt_formats/hecs-sesc/pdf/tobac-tabac/legislation/reg/indust/method/main-principal/nicotine/nicotine_e.pdf (accessed 20 May 2016). Contributors MLG contributed to the conception of the work. MLG, PAH, NJL and RIL contributed to data analysis and drafted the manuscript. NJL and RIL ran experiments. All authors approved the final version of the manuscript. MLG has full access to all study data and takes responsibility for the integrity of the data and accuracy of the data analysis. Funding Research reported in this publication was supported by the National Institute on Drug Abuse of the National Institutes of Health under Award Number R01DA037446, the National Cancer Institute under Award Number P30 CA016056 and the Roswell Park Alliance Foundation. Competing interests MLG reports grants from and served as an advisory board member to pharmaceutical companies that manufacture smoking cessation drugs. Other authors declare no conflict of interest. Data sharing statement Data could be made available to qualified researchers by request to the corresponding author.